With a population of more than 275.000 inhabitants, Wiesbaden is the second largest municipality in Hesse. Both the city itself and the surrounding area have a lot to offer for visitors. There are many things to see in this area when travelling with a rental car. After all, a car is much more flexible and, especially in the Rheingau region, you can go to a number of beautiful places that are difficult or impossible to reach by public transport. Those of you who do not travel to Wiesbaden by car usually arrive by train or plane at the nearby Frankfurt Airport (FRA). Since this airport is the largest airport in Germany, there are not only a large number of national and international flights, but also all well-known and important car rental companies there with their own local agencies. Therefore, it is a good idea to research offers on the Internet and compare prices before you depart for a trip to Wiesbaden in order to book your rental car with a good rate online at Driveboo.com. When arriving in Germany, you can just pick up your rental car at the airport station. Thanks to the direct connection to the motorway, the city centre of Wiesbaden can usually be reached quickly by rental car. This option is especially advantageous from the very beginning, if you would have to pay the costs of a taxi for such a trip. If you take this into account, you can see how cheap the offers are when comparing prices on the Internet and it makes sense to rent a car for a city trip to Wiesbaden. The city of Wiesbaden has a lot of attractions to offer for visitors. If the booked hotel is located in downtown Wiesbaden, it is convenient to leave the car in the car park at the hotel or in the car park and to go on foot from there on tour, because parking spaces in the city centre are often scarce. The most important points of contact are all located within the so-called Historical Pentagon, which forms the core of the Old Town. As Wiesbaden is a former residence city, the former city palace of the Dukes of Nassau is located in the centrally located Schlossplatz. It was built between 1837 and 1841 as a replacement for the former manor houses in Usingen and Biebrich. Today, the castle is the seat of the Hessian parliament. The Old Town Hall is located directly opposite the Old Town Hall, which was built between 1608 and 1610 and is thus the oldest still existing building in Wiesbaden. The stone reliefs on the underside of the windows on the upper floor symbolize the virtues of strength, charity, justice, wisdom and moderation. These are copies of the wooden originals exhibited in the Wiesbaden Museum. The market church is also worth a detour, which was built in the nineteenth century like the castle and its 98-metre high tower is still the tallest building in the city. Even though Wiesbaden is a rather young city in terms of the building fabric for German circumstances, even in the old town area, Wiesbaden nevertheless has its own unique architectural charm. Because in the war, there was comparatively little destruction here. For this reason, many buildings in Wiesbaden that were built in Art Nouveau style have survived. Unlike in many other places, these are not unique pieces of art, but complete streets of these and related types can be admired. If you don't feel like running on asphalt after exploring the old town, you can park your rental car at the Kurpark. This is laid out on an area of 7.5 hectares in the style of a typical English landscape park. Whoever goes there should definitely have a look at the splendid interiors of the Kurhaus, where a casino is nowadays operated. It is also recommendable to stroll at least once along the boulevard of Wilhelmstraße with its many shops, most of which are highly exquisite. 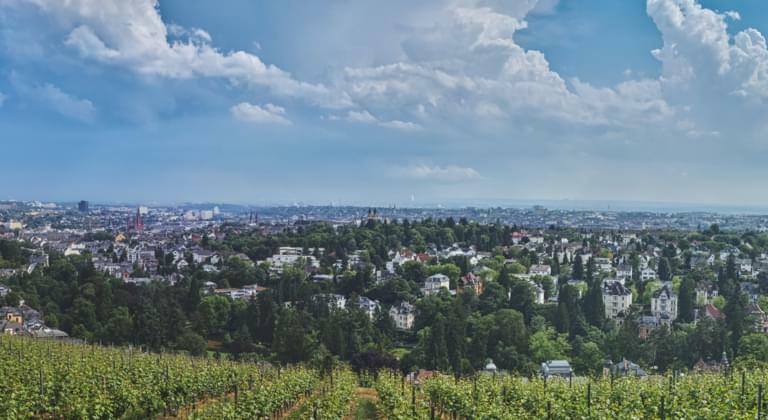 The advantage of being on the road in Wiesbaden with a rental car is even more evident when it comes to exploring the surrounding area of the city in the south of Hesse. From Wiesbaden you can not only get to Mainz very quickly, but also drive to Frankfurt am Main, Darmstadt and many other places in the Rhine-Main area via the motorway. Mainz is also a former residence city. It was the seat of the Archbishop of Mainz, who was one of the only seven electors of the Holy Roman Empire of the German Nation. The history of Mainz also goes back much further than that of Wiesbaden, since the city was already in Roman times the seat of the legion for the protection of the Limes. Today it is mainly the old town with its cathedral and the banks of the Rhine that attracts the most visitors to the city. Another touristic close by to Wiesbaden is the famous banking city Frankfurt am Main. The car can be parked in one of the many multi-storey car parks. From there, the city's main attractions are all within walking distance. This applies especially to the centrally located Römerberg. There you can gain an impression of the former half-timbered old town of Frankfurt. The rental car can remain in the multi-storey car park for the time being, because the Paulskirche is the closest important landmark of the city. The first democratically elected German parliament met there in 1848. To explore the modern Frankfurt with its impressive skyline, it is advisable to pick up the rental car. The skyscrapers are usually the headquarters of major banks, since the European Central Bank's headquarters as guardian of the euro are located in Frankfurt. The city enjoys a corresponding importance as a financial centre. The most interesting view is from the viewing platform of the Maintower, which can be reached by elevator. Here, too, the rental car can be parked conveniently in the multi-storey car park nearby. The rental car has to be parked less often if you drive from Wiesbaden in the direction of the Rheingau. You should definitely make such a detour with the rental car. After all, the part of the Rhine valley that is famous all over the world begins almost immediately after Wiesbaden. By car, you can get out of the city in less than half an hour with little traffic. Then you drive along the vineyards with your rental car and past wine villages like Eltville and Rüdesheim. if you like, you can take the car to the memorial of Germania am Niederwald. Or you can take advantage of the local wine tasting facilities. However, this option is only cheap if there is a sober driver for the rental car afterwards. We advice you to do a price comparison in the Internet to rent a car as cheaply as possible for your stay in Wiesbaden. Even if you want to have a good and cheap lunch, there is a clear advantage in the Rhine valley with a rental car. The offers beyond the touristically shaped places in the immediate Rhine valley are usually much cheaper than those within Rüdesheim, Kaub or St. Goarshausen. In addition, such a trip to the Rhine by car also includes a visit to the Loreley rock. Once you have taken advantage of the local gastronomy and explored this part of Hesse extensively, you can go back to Wiesbaden and visit the hotel. There, the gastronomy offers are even more varied and you can end a nice day in Hesse with one or more glasses of wine and a good meal. After all, Wiesbaden and its environs are waiting for more sights in and around Wiesbaden the next day.